Look closely at this stunning advert. 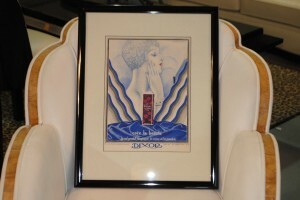 Stunning Art Deco original advertisement by legendary French poster artist Alexis Kow (1901-1978). 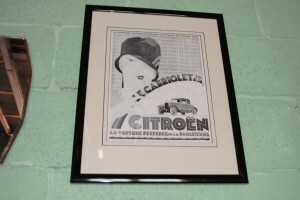 Expertly showing the 30′s era of the love of travel and automotive enginineering at its very best. Cars,planes,trains and ocean liners illustrated in monochrome with flashes of red. 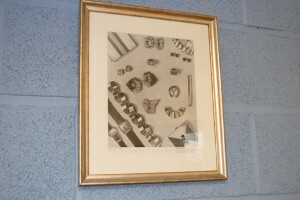 Stunning , dated and Guarenteed original, framed in high gloss black by experts. 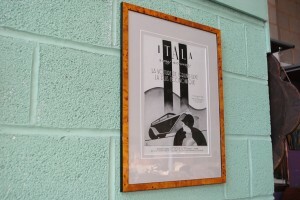 Art Deco 1930′S advert for Talbot automobiles. 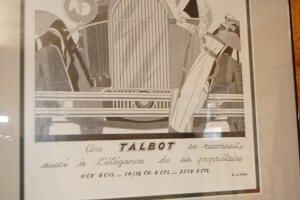 Illustrator Marcel Jacques Hemjic advertising Talbot autos which was a British brand name used to sell Imported French Clemont -Bayard cars. 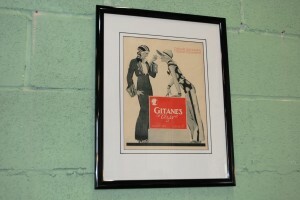 Guarenteed original and dated , not a print and expertly framed just for you. Glamourous Girl and great Art Deco look. 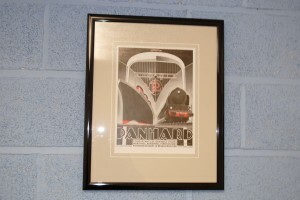 A framed original art deco 1931 advert for the iconic French Ironworker and designer Edgar Brandt (1880 – 1960). Trained at the Ecole Professionnelle de Vierzon he set up ironmongery in Paris where he created gates, balustrades, floor lamps and chandeliers in bronze, wrought iron and steel for grand houses and ocean liners (including the Normandie). After WW1 he created Tomb of the unknown Soldier under the arc de triomphe. He also participated in the famous exposition international des arts Decoratifs de 1925 in Paris making the monumental gate of the exposition. 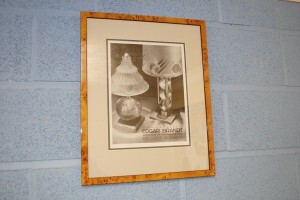 The way the Edgar Brandt products, the lamp, desk set and the fabulous fire guard are reflected in the Edgar Brandt mirror is fantastic. 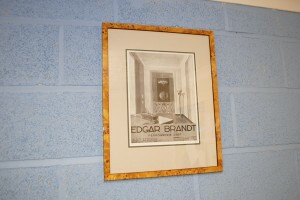 A framed original art deco 1931 advert for the iconic French Ironworker and designer Edgar Brandt (1880 – 1960). Trained at the Ecole Professionnelle de Vierzon he set up ironmongery in Paris where he created gates, balustrades, floor lamps and chandeliers in bronze, wrought iron and steel for grand houses and ocean liners (including the Normandie). After WW1 he created Tomb of the unknown Soldier under the arc de triomphe. He also participated in the famous exposition international des arts Decoratifs de 1925 in Paris making the monumental gate of the exposition. Brandt also worked in collaboration with others including the Daum glass factory creating wonderful lamps including the ‘Cobra’ featured in this advert. 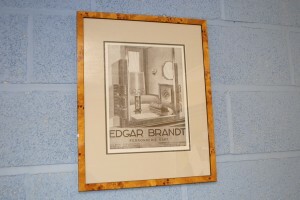 A framed original art deco 1932 advert for the iconic French Ironworker and designer Edgar Brandt (1880 – 1960). Trained at the Ecole Professionnelle de Vierzon he set up ironmongery in Paris where he created gates, balustrades, floor lamps and chandeliers in bronze, wrought iron and steel for grand houses and ocean liners (including the Normandie). After WW1 he created Tomb of the unknown Soldier under the arc de triomphe. He also participated in the famous exposition international des arts Decoratifs de 1925 in Paris making the monumental gate of the exposition. This advert for Edgar Brandt Table Lamps is a great example of how Brandt worked with some of the best glass designers of the time ! 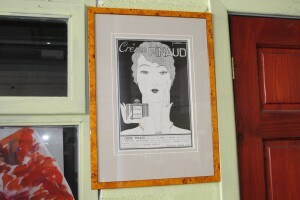 A French framed art deco Jewellery Advert Print. For more details please call 01257 473688.